Go to SETTINGS > Store Settings. Default Landing Page: Choose where your customers will land in the store by default (first category or featured products). Cart Mode: Choose between a regular shopping cart (customers can checkout and buy products) or inquiry cart (customers can submit an inquiry about buying products). Shipping Cost Label: Choose what label to use for shipping cost information (Shipping or Delivery). Full Width Layout: Toggle Yes to display the store in full width of the website. Show Retail Price: Toggle Yes to display product's retail price in addition to your price (percentage discount is calculated automatically). Require Shipping Address: Toggle Yes if physical goods need to be shipped to customer, No - if products are digital. 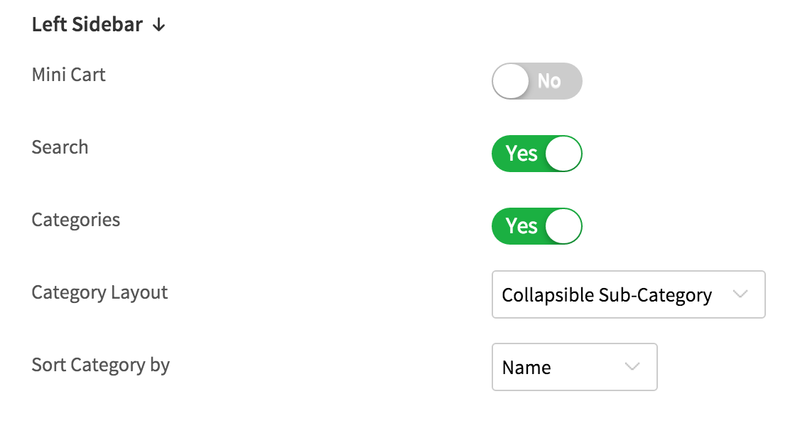 Display Option in product list page: Toggle Yes to show Product Options (size, color, etc.) on the product list page. Qty Discount uses Order History: Toggle Yes if quantity discounts are offered and need to be calculated based on previous orders. Weight: Choose to displays weight in either kilograms or pounds. Sort Featured Products by: Choose how to sort featured products. Show to approved Customers only: Toggle Yes to only show price to customers that have been approved. Show multiple currencies: Toggle Yes to show product prices in different currencies. Minimum quantity per order: Set the minimum quantity of products that is need to place an order. 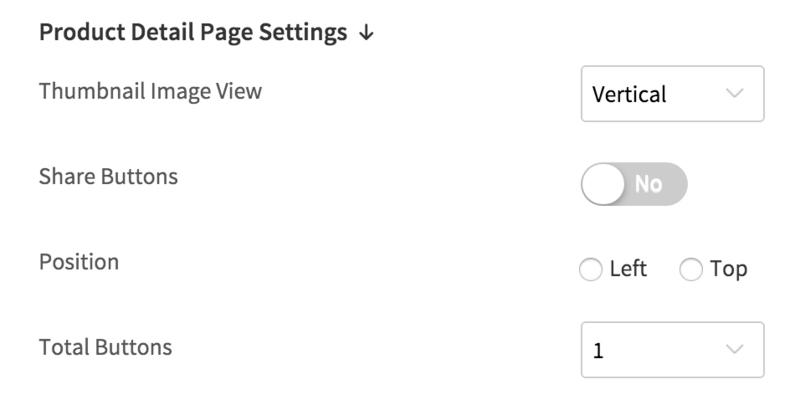 Mini Cart: Toggle Yes to include a mini cart summary in the left sidebar of your store. Search: Toggle Yes to add a search field in the left sidebar. Categories: Toggle Yes to show product categories in the left sidebar. Category Layout: If categories are enabled for the left sidebar, choose to only show categories or also collapsable sub-categories. Sort Category by: If categories are enabled for the left sidebar, choose how to sort them. 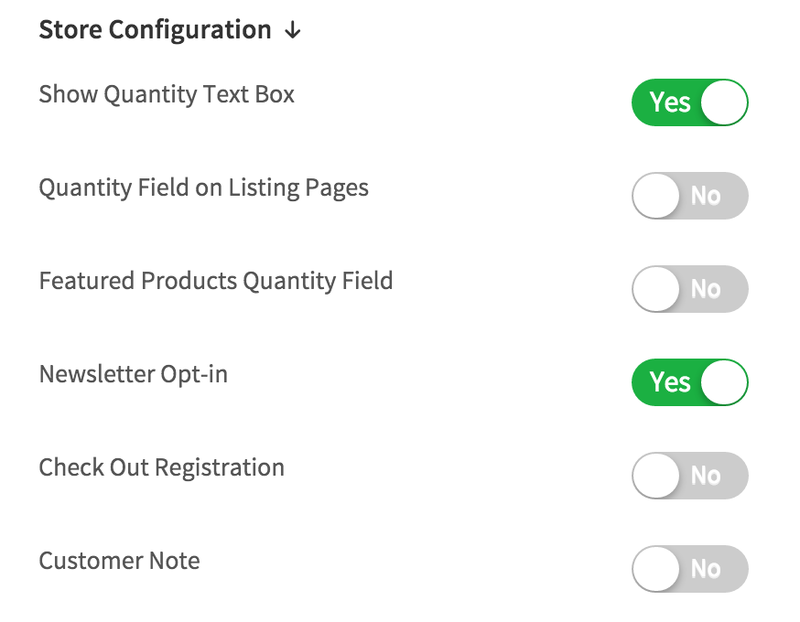 Show Quantity Text Box: Toggle Yes to allow customers to enter quantity of products they want to add to their cart. 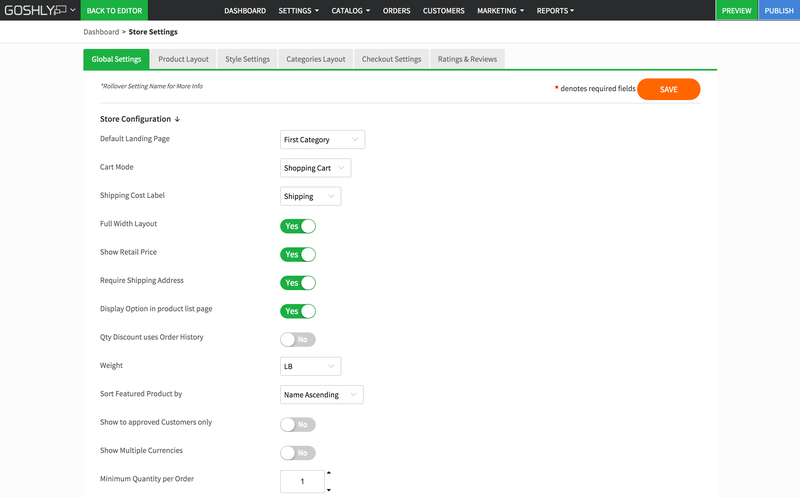 Quantity Field on Listing Pages: Toggle Yes to allow customers to add multiple products to their cart from the product listing page. This option works best if Product Options feature is not enabled and if it is not necessary for customers to go to product details page. Featured Products Quantity Field: Toggle Yes to enable Add to Cart on Featured/Best Selling Products. This option works best if Product Options feature is not enabled. Newsletter Opt-in: Toggle Yes to automatically opt-in customers to your newsletter on checkout. Checkout Registration: Toggle Yes to require your customers to register in order to complete checkout. Customer Note: Toggle Yes to allow customers to add additional notes to their order during checkout. Top Band: Toggle Yes to allow ecommerce top band section in your store. 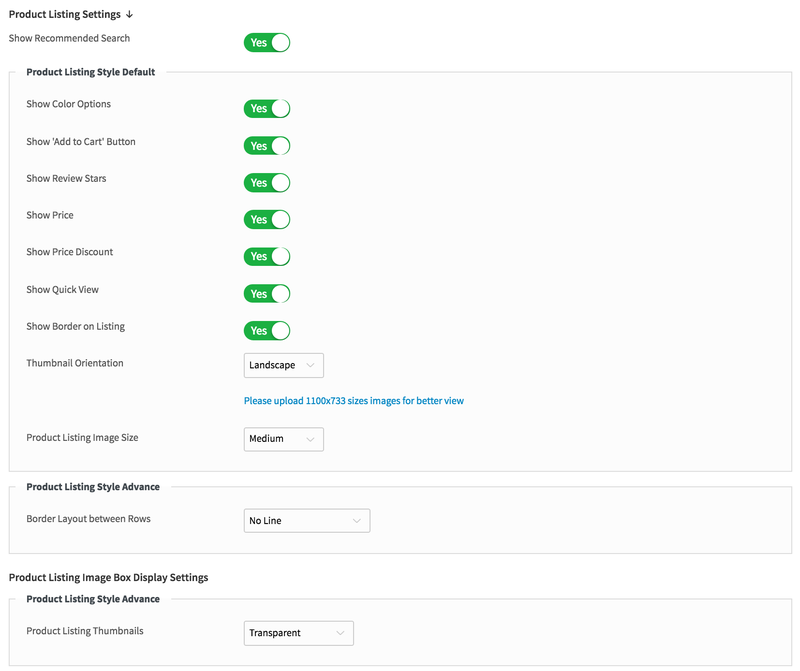 Header: Toggle Yes to allow header section in your store. Footer: Toggle Yes to allow footer section in your store. Copyright: Toggle Yes to allow copyright section in your store. Wholesale Mode: Select No if you don't offer quantity discounts in your store. Number of Wholesale Levels: Choose the number of wholesale levels. If Discount Levels were chosen for the Wholesale Mode, then enter discount percentage for each discount level. Best Seller Layout: Choose a style for best seller products from dropdown list. Best Seller products on homepage: Set the number of best seller products to display on best seller products homepage. 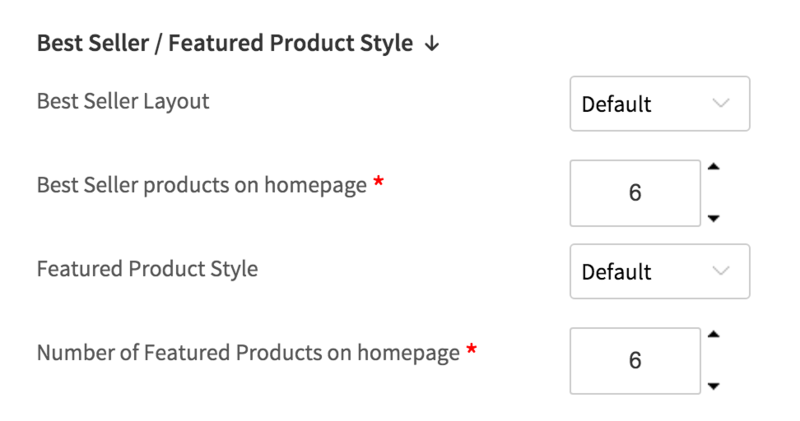 Featured Product Style: Choose a style for featured products from dropdown list. Number of Featured Products on homepage: Set the number of featured products to display on featured products homepage. Show Recommended Search: Toggle Yes to show recommended search option on the shopping cart page. Show Color Options: Toggle Yes to enable color option on the product listing page. Show 'Add to Cart' Button: Toggle Yes to show "Add to Cart Button" on the product listing page. Show Review Stars: Toggle Yes to show review stars on the product listing page. Show Price: Toggle Yes to show price on the product listing page. Show Price Discount: Toggle Yes to show price discount on the product listing page. Show Quick View: Toggle Yes to show Quick view of products on the product listing page. Show Border on Listing: Toggle Yes to show border on the product listing page. Thumbnail Orientation: Choose between landscape and portrait orientation for thumbnails. Product Listing Image Size: Select the image size from the dropdown. Border Layout between Rows: Select broder layout style between rows from dropdown. Product Listing Thumbnails: Select product listing thumbnails from dropdown. Filters Position: Choose between top or left position for the filters. 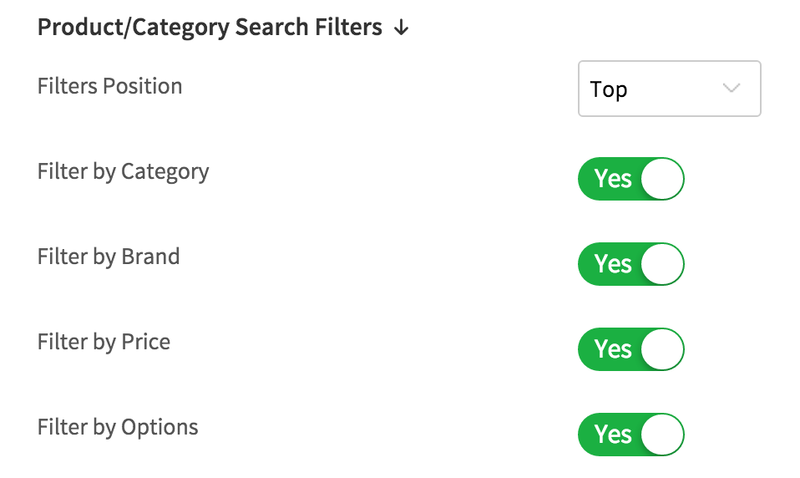 Filter by Category: Toggle Yes to enable filter products by category. Filter by Brand: Toggle Yes to enable filter products by brand. Filter by Price: Toggle Yes to enable filter products by price. Filter by Options: Toggle Yes to enable filter product by options. Thumbnail Image View: Choose between horizontal and vertical for the thumbnail image view. Share Buttons: Toggle Yes to enable share buttons on product details page. Position: Select position for product detail page. 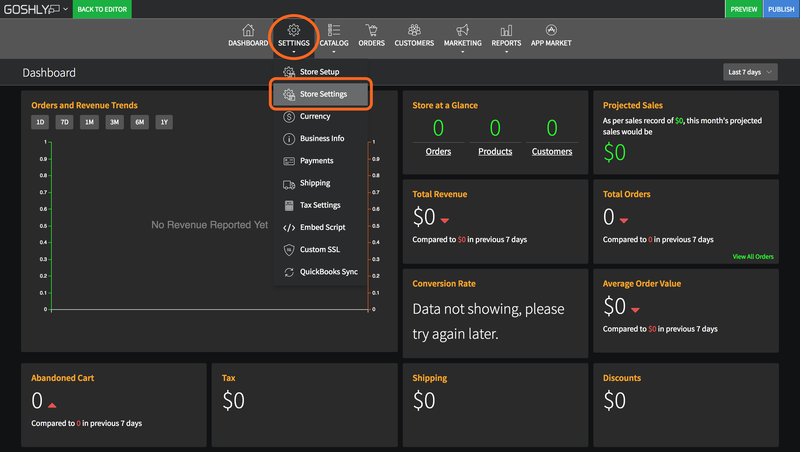 Total Buttons: Select number of buttons to be displayed on product detail page. Social Follow Icons: Toggle Yes to enable social follow icons. Category Font: Choose font for product categories. Category Font Color: Choose color for product categories. Category Font Size: Set font size for product categories.. Product Font: Choose font for product listings. Button Style: Choose between theme default and custom style. Background Color: Choose background color for the button from color picker or enter RGBA values. Text Color: Choose text color for the button from color picker or enter RGBA values. Border Color: Choose border color for the button from color picker or enter RGBA values. Font: Choose font for the button. Padding(px): Set padding for the button. Border Width(px): Set border width for the button. Border Radius(px): Set border radius for the button. Border Style: Choose between solid, dashed, or dotted for the border style of the button. Preview: Preview the look of the button as you customize the settings above. Category Layout: Choose between default and carousel layout for the style of categories. Category Layout Default (if Default was selected for Category Layout): Choose between three or four column boxes. Show More Categories: Toggle Yes to show more categories. Categories per Page: Set the number of categories to show per page. Country Field Name: If needed, change the field name shown during checkout (default is 'Country'). State Field Name: If needed, change the field name shown during checkout (default is 'State'). Zip Code Field: If needed, change the field name shown during checkout (default is 'Zip Code'). 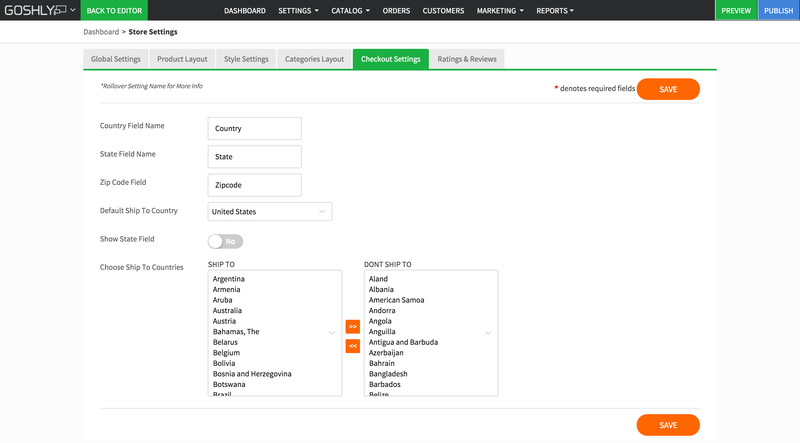 Default Ship to Country: Select the country that will be shown as default in the country dropdown (original default is United States). Show State Field: Toggle Yes to show 'State' field during checkout. Choose Ship to Countries: Leave all the countries you will ship to in the SHIP TO column, and move all the countries you won't ship to to the DONT SHIP TO column. Number of Stars: Select number of review stars to show (common practice is to use 5). Customer Reviews: Toggle Yes to let customers see reviews for products. Merchant Rating: Toggle Yes to show merchant's (your own) rating of the products. Ratings Require Login: Toggle Yes to require customers to login in order to rate a product. Customer Review: Toggle Yes to enable customer reviews. Reviews Require Login: Toggle Yes to require customers to login in order to leave reviews for products. Review Approval: Toggle Yes to require admin's approval before any reviews are visible in the store. Display Customer by: Choose how to display customer's identity associated with review (username, or full name, etc. ).